Children decorate pumpkins at the 2013 Harvest Festival. NOLITA — The Elizabeth Street Garden is welcoming New Yorkers of all ages on Saturday for its second annual Harvest Festival. The event starts at noon and runs until 4 p.m., with games and activities like daffodil bulb-planting and pumpkin-decorating, with pumpkins donated by Whole Foods. Early birds can beat the kid-heavy rush for a meridian tapping class at 10 a.m. or a vinyasa yoga class at 11 a.m.
"There is something for everyone, from 8 months to 80, to welcome in the fall with a little country fun in the heart of Manhattan,” said Emily Hellstrom, a volunteer at the garden since its inception. Festival-goers are encouraged to test drive their Halloween costumes and bring their own hand-carved jack-o-lanterns for a contest. Ribbons will be awarded at the end of the event for the funniest, scariest and craziest designs, and pumpkins can remain in the garden on display through Halloween. The event is a collaboration by neighborhood businesses and residents, with local musicians performing live throughout the day, and refreshments provided by some of the neighborhood's hottest eateries, including the newly opened Black Seed, as well as old favorites like Cafe Habana, PUBLIC and Tacombi. 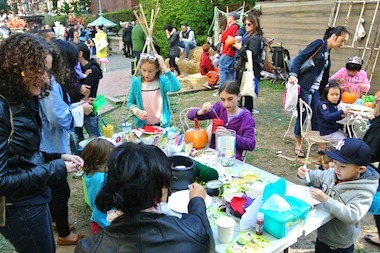 McNally Jackson bookstore is setting up a Halloween crafts station for kids to decorate wooden coffins, create costumes and play games, and staff from Little Peep Prep, an early childhood center on Houston Street, will help kids make masks, while volunteers from the Chinatown YMCA paint faces. "This is a community event in every sense of the word... the ultimate fall melting pot, offering something for everyone," said John Benscoter, a 25-year resident of Elizabeth Street and another of the garden's first volunteers. Festival attendees are asked to bring canned vegetables for a food drive to help out the Bowery Mission in advance of its big Thanksgiving meal next month. Second Annual Harvest Festival, Elizabeth Street Garden, on Elizabeth Street between Prince and Spring streets. 10 a.m. to 4 p.m., Saturday, Oct. 25.